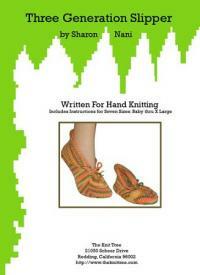 Cotton Dish Rag Cloth hand knit Patterns written by Sharon Nani. Three patterns are included for Fisherman Rib, Racked Rib, and Vertical Stripes of Fisherman Rib with Racked Rib. These patterns assume the knitter knows how to form a knit and a purl stitch, basic cast on and basic bind off. Our popular Cotton dish rags knit by the Little Knitters get requests for the knitting pattern as well. So this knitting pattern is finally being shared with you! Yarn Kits with the cotton yarn are also available with or without the pattern in our Yarn Kits Show Room! It starts with the beginner Fisherman Rib Dish Rag, then advances to the same dish rag in a racking rib pattern. Finially it tests your creativity by striped pattern with both fisherman rib and racked rib combine and a scallop hem tip. Sharon knit the sample dish rags by hand and on both the Passap DM80 (E6000 follows same directions without the console) and the Brothers Standard Gauge knitting machine with Silk Cities Softball 2.2 Cotton and Bonnie Triola's Double Spiral Cotton / Acrylic yarn. Yarn kits with enough yarn for all three dishrags are in the yarn kits show room. 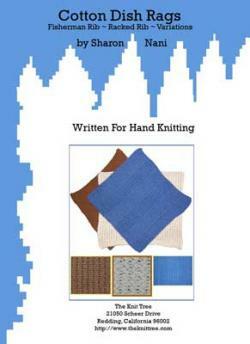 Sharon Nani has been writting instructional patterns and knitting programs for schools, industry, and magazines for over 30 years. Watch for more of her patterns coming to this online store. This is the second pattern that she teaches "The Little Knitters", they love the simplicity and the creative choices that it gives them - and I'm sure you'll love it too!! Remember we are sharing this treasured pattern with you for your personal pleasure, knit them for gifts, for yourself, or they make great shower gifts or donations for fund raising events.